Creflo Dollar is a world-known Prosperity & Word of Faith cult leader who uses the bible to steal money from his followers. 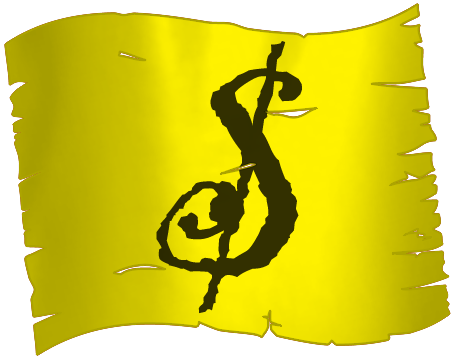 Mark of the Prosperity cult. 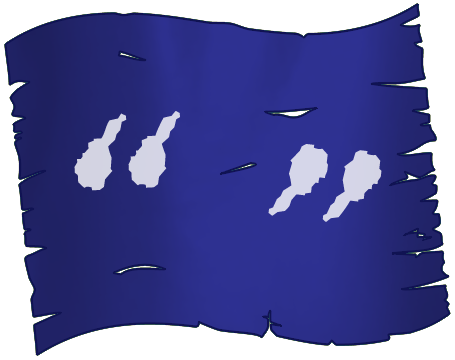 Mark of the Word of Faith cult. Keep in mind, Creflo Dollar is the same King Kaching who strongly urged his congregants to each donate $300 in order to purchase a Gulfstream G650 Jet (which costs around $70 million) while claiming it would help his ministry. Creflo Dollar wants your money… to buy a $65m jet? Will Creflo use his billion dollar gimmick to get his $65 million dollar jet? The below piece written by Creflo Dollar is nothing but a disgraceful mash up of different Bible verses ripped from context in order to give the false impression that the Bible teaches Dollar’s blasphemous Prosperity Gospel. It’s surprising that Creflo pulled his controversial tweet stating that Jesus died so that people can claim the promise of financial prosperity, when this below article states exactly the same thing. The old covenant, before the cross, was based on what the people had to do first before receiving a blessing—they had to obey in order to be blessed. After the cross, the order was changed, and now the focus is on what Jesus has already done. We are blessed because of our belief in His perfect obedience, not ours. Now, our obedience is not the same type of requirement as described in the Old Testament, but rather a response to Jesus, and the fruits of the spirit. Faith, love, and forgiveness are also responses. Studying God’s Word, we learn to trust Him enough to become givers. When we diligently study the Word and correctly interpret it, we can be effective workers for God (2 Timothy 2:15). We should eagerly do our best to present ourselves to Him after we are tested by trials and found to have no cause for shame. Religious interpretations of the Bible are fables. We must demonstrate to ourselves our faith and trust in God through our tithes and offerings (Luke 16:10, 11). Money is the smallest way we can possibly demonstrate our trust in Him. Jesus gives seed to the sower and bread to the hungry (2 Corinthians 9:10). He gives money to those who give. He takes care of His children. After the cross, financial blessings are now a result of what Jesus has already done for us, not what we think we are required to do according to the old covenant. Jesus bled and died for us so that we can lay claim to the promise of financial prosperity. He took our sins upon Himself and exchanged them for His righteousness so that we could become enriched and abundantly supplied (2 Corinthians 8:9, AMP). Because of the cross, we have a blood-bought right to be abundantly supplied. God will take care of us even more than the birds of the air, which neither sow nor reap (Luke 12:24). All we need to do is trust in Him enough to tithe and give offerings. In the book of Malachi the people were required to give first before receiving God’s favor, and that failing to tithe and give offerings brought a curse and was the same as robbing God (Malachi 3:8-11). 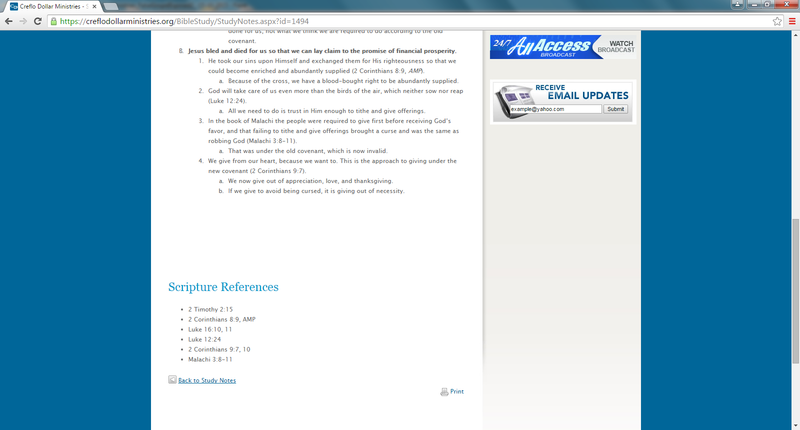 That was under the old covenant, which is now invalid. We give from our heart, because we want to. 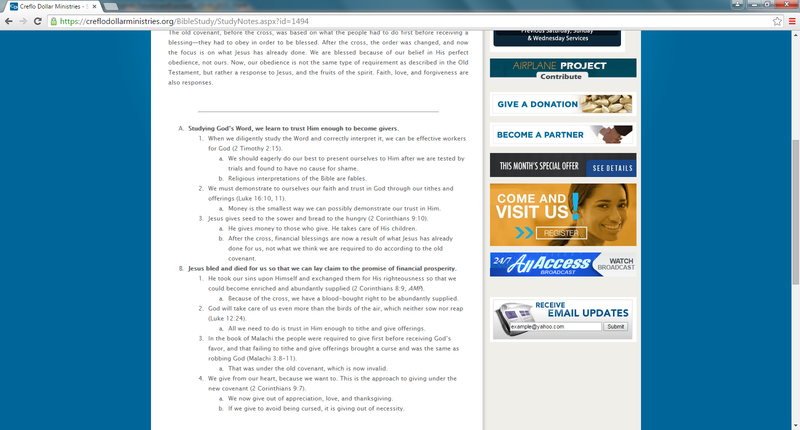 This is the approach to giving under the new covenant (2 Corinthians 9:7). We now give out of appreciation, love, and thanksgiving. If we give to avoid being cursed, it is giving out of necessity. 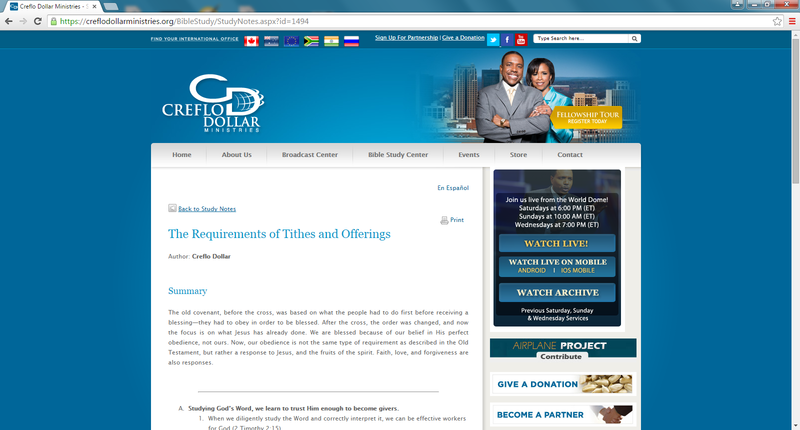 Source: Creflo Dollar, The Requirements of Tithes and Offerings, Creflo Dollar Ministries, https://creflodollarministries.org/BibleStudy/StudyNotes.aspx?id=1494, Accessed 14/10/2015. What these men and women who teach this doctrine fail to realize is that God has and will bless us with those things that they saying that you have to give tithes and offerings for!! !We give because we love Him and want to see His Word be preached and taught all over the world! @ chatnboy that’s exactly what he is saying, he is saying under the new covenant your prosperity is guaranteed. Because of the blood not based on tithes and offering. You now give those because you love him, that is out of a grateful heart so that the gospel can be preached.